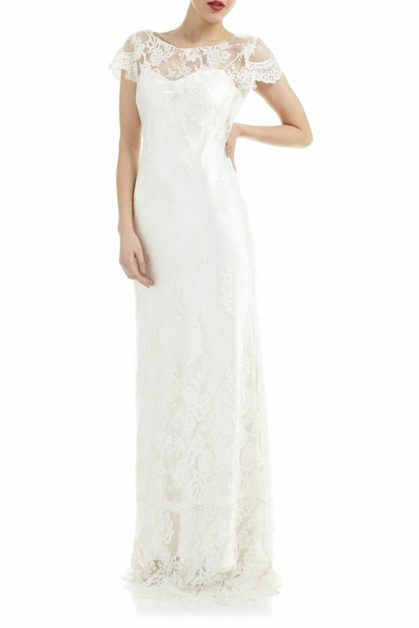 Portia Gown by Amanda Garrett made with a full French vintage-style lace overlay with cap sleeves and scalloped lace edge hem featuring a flattering scoop high neckline and plunging low back. Comes with separate satin underlay slip. An elegant yet relaxed and feminine bridal style! Loved by modern romantics for her luxury vintage inspired wedding dresses with a contemporary, style conscious flair, Amanda Garrett’s Portia gown is a dream wedding dress. 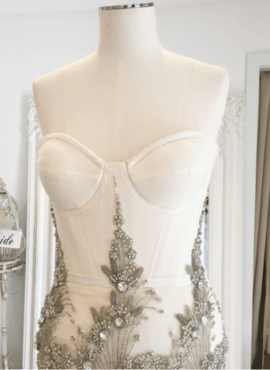 This sample designer wedding dress is available to try on at The Barefaced Bride studio.